Welcome to the Couch Club, our weekly column devoted to all things #DCTV! 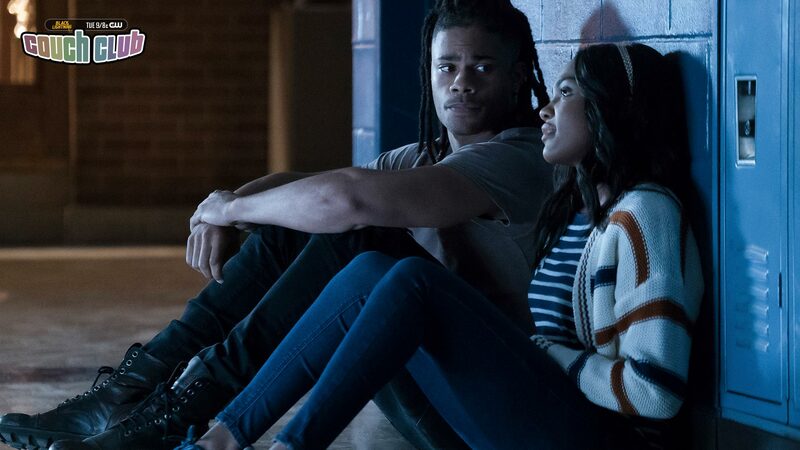 This week, Lissete Gonzalez looks at Black Lightning's Jennifer and Khalil, and discusses how the only thing harder than being a superhero is being a teenage one. For most of us, our teenage years are both an exciting, yet confusing time in our lives. There are fun things to discover like high school parties, dating and making new friends. But at the same time, it’s also a defining era where we’re often riddled with self-doubt about who we are as individuals and what type of person we want to become someday. So, imagine being a teenager going through all of those things while also inheriting superpowers from a superhero parent……that’s like taking complicated and multiplying it by 1,000! As I’ve been keeping up with Black Lightning, I’ve found myself really connecting and empathizing with the identity crisis that both Jennifer Pierce and Khalil Payne have been going through together since the show first started. I mean, I might not have superpowers like them, but regardless of that, what they’re feeling is something that’s very relatable and human. Clearly, Jennifer has a loving family that cares for her and she’s never once doubted that—but no family is perfect. Her parents have always had very high expectations for her. She’s a highly esteemed student, a track athlete and has a reputation to live up to as the daughter of her high school’s principal. While these are all great characteristics to have for someone her age, they don’t feel genuine to her and feel as if they were decided by her parents rather than by her own will. Khalil, on the other hand, is different. Before he became paralyzed, he always knew the type of person he was and what he was destined to become. He was a well-rounded young man and a star track athlete who knew that he’d be getting a college scholarship and a chance at a better life. Once he lost his ability to walk, his scornful and resentful side came out, which made him question his good morals and identity. This ultimately led him down a dark path to regain his ability to walk again. They have both been through a lot and continue to have a lot going on in their lives, but once you throw their superpowers into the mix, it adds a whole other dimension to the identity crisis they’re each having. Are they more meta than they are human? Can they even live a normal teenage life? Can they live a regular life at all? It’s a whole lot of introspection for a superhuman teenager to go through, aside from what a typical teenager already has on their minds. The Pierce family had kept Jefferson’s Black Lightning secret hidden from Jennifer for most of her life. It wasn’t until she discovered she had powers of her own that everyone came clean about her father’s role as Black Lightning and her sister Anissa’s as Thunder. With this revelation came even more pressure on Jennifer. In this new season especially, Lynn and Jefferson have become extremely overprotective of Jennifer and kept her confined in their house out of fear that she would harm herself or others with her new and untamed abilities. In addition to that, she initially really resented her powers and wanted nothing more than to lead a normal life. She envisioned going to prom, going to college and getting married someday. What her older sister Anissa saw as a gift given to them from God, she saw as curse from the Devil. While all this happens, Khalil attempts to slip away from the dangerous life he chose as Painkiller, which is the price he had to pay to regain the ability to walk. When he comes to Jennifer to reconcile, they both relate to the challenges they have faced, overlook the past complications in their relationship and decide to run away together to escape the pressures they are each facing as metas. It’s funny how running away is a typical impulsive “teenage” decision to make, but at the same time they’ve been through some mature situations that in many ways justify their choice in doing so. The dynamic between Jennifer and Khalil as they develop their identities is one of many from the show that help make this series about super-powered crimefighters relevant to real life. I’m both curious and excited to see how the relationship between Jennifer and Khalil will shift throughout the rest of the season as the trauma of recent events play out and both Jennifer and Khalil start to solidify who they will become. It’s also worth mentioning that last month we got a first look at Jennifer suiting up in her new Lightning suit. After all she’s been going through leading up to this, it’s exciting to think that we’ll finally see her embrace her superpowers and fight alongside Black Lightning and Thunder. But not only that, by claiming this superhero identity, she’ll be one of the first black female teenage heroes on the small screen. I’m absolutely living for that! Black Lightning airs Mondays at 9 p.m. (8 p.m. CST) on The CW. Lissete Gonzalez writes about TV, movies and comics for DCComics.com and is a regular contributor to the Couch Club, our weekly television column. You can find her on Twitter at @lissete74. Supergirl: What's So Funny About Supergirl vs. the Elite? Black Lightning: Are We Getting the Outsiders? Gotham: Can Barbara be Redeemed? Elseworlds: The Batwoman of Gotham is Here! Arrow: Who—and WHAT—is the Silencer? The Flash: Who is XS?